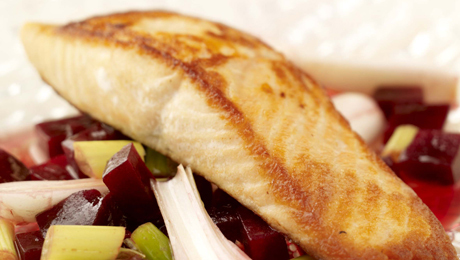 This salmon dish is the perfect light meal and goes perfectly with the beetroot salad. Drizzle a large pan with 1 tbsp of olive oil and place on the heat. Add the salmon and season with salt and pepper. To prepare the beetroot salad, dice the beetroot into small pieces and thinly slice the spring onions. Place the beetroot and spring onion in a bowl and squeeze over the lemon juice and 1 tbsp olive oil, season with salt and pepper. To serve, place a generous serving of the salad on the centre of the plate and place the salmon on top. Try adding some feta cheese to the beetroot salad for added flavour, also perfect served with couscous.